Student Reviewer today is Alex. 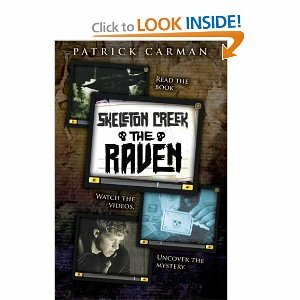 The book I read was Skeleton Creek: The Raven by Patrick Carman. The characters were: Ryan - a boy who discovered many treasures about his town, Sarah - Ryan's best friend who helps Ryan. There are also Ryans' parents who don't know about what Ryan does and Fitz, Ryan's friend whose dad is the Raven. Ryan in the last book finds how there was an organization called the crossbones. They had a bunch of mysteries that lead to big discoveries. Well in this book there is a mystery and Fitz's dad is trying to stop Ryan from figuring it out at all costs. His friend Sarah is driving all around the U.S. trying to find the clues. Will Ryan find it, will the Raven kill him before he does? You have to read to find out. I connected with this book because like Ryan I am curious. I thought this book was amazing. The outcome was very interesting. I would recommend this to anyone who likes a good mystery.